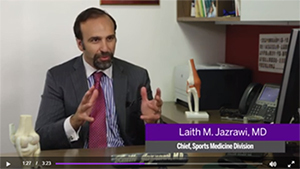 Our sports medicine experts at NYU Langone treat the full spectrum of athletic injuries in children and adults, from high school athletes, to professional athletes, to recreational athletes, such as golfers, runners, and tennis players. Our surgeons perform more than 3,000 procedures annually, including arthroscopic procedures on the knee, shoulder, elbow, and ankle. Our sports medicine physicians also employ advanced, nonsurgical techniques to aid healing, including injections using platelet-rich plasma therapy. And, we focus on the rehabilitation of sports-related injuries to prevent such injuries from happening again.